For most of us, getting motivated is not hard. But sustaining it long enough to accomplish meaningful goals is challenging . "The Motivation Myth" - a book by Inc's most popular columnist presents a path breaking approach to long lasting motivation needed to attain success! For most of us, getting motivated is not hard. Right? Motivational podcasts, reading inspirational books or lets be honest, sometimes even a Katy Perry song played in high volume is enough to get all pumped up and ready! But is this kind of motivation sustainable? Can we actually use this instant spark of energy to accomplish meaningful goals over long term? This momentary spike in inspiration is kind of similar to sugar rush where it feels awesome in that moment and eventually it does drain out. This is also the reason behind why 80% of us give up on our New Year resolutions by end of Feb! So how do you stay motivated? How to keep going when you are 0% motivated? This is when the book “The Motivation Myth” can turn out to be a true game changer! 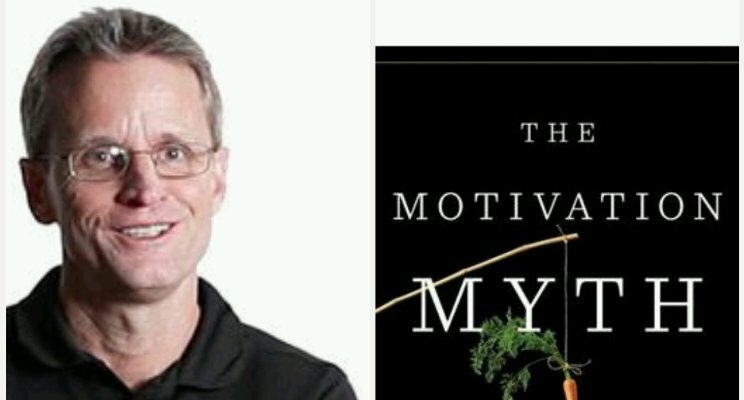 Written by Inc Magazine’s most popular columnist and one of most widely followed influencers on LinkedIn, Jeff Haden offers a fresh perspective of how motivation actually works and how you can leverage success to create motivation! Jeff Haden is not a stranger to success himself and is a serial achiever! Whether it is starting a business, losing ten pounds in a month or gaining more than 2 million fans for his work, he has done it all!! Hence there is strong validation to his groundbreaking approach to Motivation and lasting success. The book debunks several common myths about motivation and provides a blueprint to your success path. Sharing some of the lessons that I learnt from “The Motivation Myth”. Jeff completely demystifies Motivation as we know and proves that Motivation is not the spark, Success is! Meaning you don’t have to wait for that spark, for that bolt of inspiration to get started! Just work your process he says, by following your process consistently and enjoying small wins along your way, you will get all the motivation you need! The author talks about goal setting and offers a detailed guide on how to set measurable goals to benefit you at multiple levels and emphasizes on the process! As much as goal setting is important, so is working the process. Without the process goal is just a dream. Want to get rich? Want to write a book? Lose thirty pounds? You need to work your process. There is no short cut, no hacks just consistent hard work. You don’t need motivation. Break a sweat literally! Unlike any other book, “The Motivation Myth “provides a much-needed mental shift towards enjoying the process! In this section, author talks about productivity and lays out plans for increasing your focus on work days. Want to have the most productive day ever? There is a step by step in the book you can’t miss! Most productive week ever? Yes, you got here too! And more valuable than these, how to develop a productive mindset? You must read the book as I cannot do justice to Author’s awesome insights! When you begin to see success as the game it really is — you will also understand that more number of times you roll the dice, more number of times you take shots, the more the chances of hitting the target. Agreed this will also make you fail, but that is ok as you are also increasing your chance of success. It is not just skill, but it is also the numbers. The book shows us through some great examples how emulating Pros and following their lead can help you accomplish a lot more. By doing this you may not get the same level of success as the Pro but certainly you will end up at a higher level than where you are right now. For doing this, you do not need to know the Pro — all you have to do is study their habits and be willing to follow. Read Biographies, stick to the workout plans, follow the blue prints and think what they do, how they do and see if you can translate it to what would you do if given the same opportunity! Jeff Haden explains how we all admire super successful people and aspire to be great. You cannot be great at everything but surely you can be the best you can be at the things do you choose to be! And for this to happen, we need to free up chunks of time to work on applying achievement strategies on the things that we do best! The book offers several ideas to explore to eliminate the unnecessary and focus on what matters . Kill one report, cut one expense , delegate one decision making task— adopting these ideas to draw out valuable time and energy for accomplishing tasks that you love to do! The author explains the concept of how small improvements will add up to a major overall improvement. This concept can be applied across any area of life that you are trying to improve. Want to be more productive? slightly streamlining the morning routine, clearing up emails and a bit more delegating can free up more time in your day to focus on what you do best. Want to improve your relationships? Complimenting your partner just a little more, allowing a little more space and finding a little more happiness in your partner’s success — You will see that relationship just got better! It is a basic process improvement exercise — select your task first, break it down into minor components and optimize on each component and you will be amazed at the cumulative result!! Author presents a convincing approach to happiness in life. He strikes a chord with every reader here as he presents a holistic view of success across all areas of life including work, family, fitness, relationships because success is not just limited to business and work after all! Jeff Haden’s simple effective and no fluff writing makes this book a great read and summarizes the fundamental concept of doing versus dreaming. Plus, the impeccable story- telling skills of author and interesting narratives of the super achievers and their approach to success will keep you engaged throughout the book and provides you with plenty of useful resources and techniques to make your goal achievable! So, in 2019, don’t just call it a dream, call it a Plan! Don’t wait for motivation, just get started! Enjoy the process and you will ultimately find all the motivation you need!